Editor/Author Paranjape, K., Gowariker, V. and Krishnamurthy, V. N., et.al. 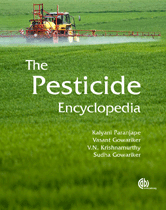 The Pesticide Encyclopedia provides a comprehensive overview of the fight against pests, covering chemical pesticides, biocontrol agents and biopesticides. It also covers interrelated topics such as pesticide toxicity, legislation and regulation, handling, storage and safety aspects, IPM techniques, resistance management, interaction of pesticides with soil and the environment.